Would fans keep my home cooler? Ceiling fans don't actually cool a room; they just make you feel cooler. That means they don't do you any good when nobody's in the room so you can turn them off. Try setting your thermostat a few degrees higher and use your ceiling fan to keep you cool while you are in the room. Michigan power and light suggests that a fan that runs constantly can cost up to $7 a month, depending on age and size. My heating or cooling does not work. What can I do? No Heat: With the system set to heat, when the set point temperature is raised or lowered past the room temperature, the thermostat will make a soft click sound within about 5 seconds. Usually the sound indicates correct thermostat operation. If the heat does not come on after raising the temperature and hearing the click, check the fuses or breakers, make sure the furnace is switched on, verify the blower compartment door is closed properly and if your furnace has a pilot verify that the pilot is lit. If no click sound is heard try resetting the thermostat as described below. If the no heat or no cool condition persists after resetting the thermostat, you may wish to contact AmericAir Control service person for assistance. indicate loss of refrigerant in the compressor. If the blower or compressor do not come on or do not shut off, try resetting the breakers, on an additional not take a look at the condensers refrigerant lines for possible freeze. If lines have ice buildup or the no heat or no cool condition persists, you may wish to contact AmericAir Control service person for assistance. How often should I replace the batteries in my thermostat? For optimum performance we recommend that you replace the batteries once a year with alkaline batteries. Why does the blower fan keep running after the system has shut off? Possible short in wiring, Check each wire connection to verify they are not shorted or touching together. Possible short in thermostat, no bare wire should stick out from under terminal screws. Fan Switch slid to Fan On, or FAN button pushed to display FAN ON. If the condition persists, you may wish to contact AmericAir Control service person for assistance. What is Two-stage Heating / Two-stage Cooling? The fan motor inside higher efficiency indoor and outdoor units is designed to change its speed based on your home's heating and air conditioning requirements. Working in conjunction with your thermostat, it keeps the appropriate-temperature air (e.g., warm air on cold days) circulating throughout your home, reducing temperature variances. The variable speed motor also increases dehumidification and is quiet because it runs at a lower speed most of the time. Plus, the consistent air circulation eliminates noisy startups and shutdowns. With Honeywell's VisionPRO® IAQ Total Home Comfort System you can now control comfort and Indoor Air Quality (IAQ) throughout your entire home. VisionPRO IAQ eliminates the need for multiple controls in your living space, by managing your home's temperature, humidification, dehumidification and ventilation - all from a single, easy-to-use touch screen control. If you want your home to feel as comfortable as it looks, then VisionPRO® IAQ is the thermostat for you. You'll enjoy the convenience, energy savings and consistent comfort for years to come. Energy Savings* -Program to save up to 33% on annual heating and cooling costs. Contains all features of standard VisionPRO, except arm chair programming. Automatically lowers humidity levels through all rooms in the home, utilizing air conditioning or a whole house dehumidifier to prevent dampness, stickiness or odors; symptoms often associated with air that is too moist. Honeywell's FocusPRO® 5000 Digital Thermostat offers the perfect blend of features, performance and value that delivers the highest degree of temperature control accuracy. With the largest backlit screen in its class and an easy-to-read display, FocusPRO prominently displays both room and set temperature. Flip-out door for easy battery replacement without removing or disassembling the thermostat. trim costs and gain control over the energy usage in your home. Cool your home at 77 degrees or warmer with the thermostat fan switch on "auto." For additional savings, raise your thermostat to 81 degrees or warmer when you're away from home. Avoid pre-rinsing dishes before putting in dishwasher. It can save up to $70 a year. Use the auto sensor function on your dryer, if you have one, to conserve energy by not over-drying your clothes. Summer: no more than six hours a day. 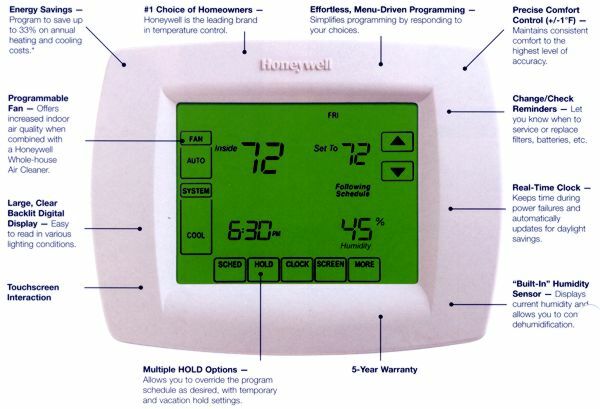 Install a programmable thermostat to adjust the temperature automatically and maximize your energy savings. It also helps to maintain a comfortable temperature when you wake up or return home. Adjust the water level on your washing machine to match the load size, especially when using hot water. Always use a cold rinse. Clean or replace your air conditioner's filter every month to trim your cooling costs and help your unit run more efficiently. Turn off your ceiling fan when you leave the room. A fan that runs constantly can cost up to $7 a month depending on size and age. Heat your home at 68 degrees or cooler with the thermostat fan switch on "auto." To save even more, lower your thermostat to 65 degrees or cooler at bedtime or when you're away from home. This year’s early spring season means that pollen counts are up. Experts say that pollen counts this year will be higher than usual. That means more suffering with the runny noses, itchy eyes and other allergy symptoms for Michigan homeowners. You can’t stop the pollen from growing, but professional duct cleaning can prevent that pollen from recirculation in your home. If your Michigan Energy Bills seem to be going up faster and faster these days, the problem may not be the high price of gas and electricity. Your heating and air conditioning system may be gradually losing efficiency. This can be due to dirty, clogged air ducts and a dirty furnace or air conditioner. Having your systems professionally cleaned can bring your heating and cooling bills back under control. Recent news about a chimney fire in Michigan brings the dangers of fireplace chimney fires home to Michigan homeowners. While the family was saved by an alert off-duty policeman, the home was badly damaged when a chimney fire escaped from the damage chimney into the home’s attic. The result could have been a major tragedy. Every homeowner needs to learn the facts about chimney fires and have their chimney cleaned by professionals. Do you and other family members suffer from allergies? You’re not alone. Millions of Michigan families are concerned with allergies an asthma. Sadly, the allergens that trigger these sometimes debilitating conditions are a common component of dust, and dust can be found in every home. In fact, there are far more allergens in most homes than outdoors. Air ducts collect and circulate allergens. Dust is everywhere. Sometimes it seems like Michigan homeowners are in a never-ending battle with dust. No sooner do you finish dusting than surfaces begin collecting dust again. Part of the problem can come from your air conditioning and heating air ducts. Whenever the furnace or air conditioner is running, dust and debris that has accumulated circulates throughout your home. Every home in America contains dust mites. These tiny creatures live in carpets, upholstery, and even our beds, but we never see them. Feeding on tiny flakes of human and pet skin, their excrement contains chemicals that are the cause of many allergies. You can’t eliminate dust mites in your home, but you can minimize their effects on your health. One of the best times of the year to get your heating and air conditioning ducts cleaned is when the seasons change from winter to spring. Get the dust, pet dander, fungi, and bacteria out of your ducts and you’ll help keep your air and home clean without interrupting your heating and cooling. AmericAir Control has several special offers that let you combine cleaning of your air ducts with our other services. By combining duct cleaning with furnace cleaning, dryer vent cleaning, and our other services, you can realize substantial savings and get everything done in one visit by our expert technicians. Summary: The air ducts in your business could be making your employees sick. It’s a fact. Respiratory problems caused by dirty air ducts could be costing you plenty in reduced productivity and absenteeism. Restore healthy air to your business by thorough HVAC system cleaning. Dirty, dust and mold-laden heating and air conditioning ducts are common in Detroit Metro Homes. You’ve seen the duct-cleaning ads on television and heard them on the radio. When you need your ducts cleaned, though, choose the company you hire carefully to make sure you get a complete, professional duct cleaning, and not just a quick, partial job. CLEAN AIR DUCTS-DO OR NOT? If you’re tempted to try to clean the dust and debris out of your own heating and air conditioning ducts, think again. It’s not a job for amateurs, and you’re likely to make the problem worse or even damage your ducts and registers. AIR DUCT DUST-WHAT’S IN IT? The heating and air conditioning ducts in your home constantly circulate all the air in your house. That air, quite naturally, is laden with all sorts of stuff you can’t normally see. You’ll be surprised at what accumulates in your air ducts. In Michigan, having a good clothes dryer is a must in every household. Today’s dryers work efficiently to dry your laundry quickly. In doing its work, it removes lint created by the drying process, trapping that lint in a filter, which should be cleaned after every load. Some lint escapes even the best filters, though, and accumulates in the dryer vent. This can lead to reduced efficiency and even poses a fire hazard. Professional cleaning of your dryer vent restores efficiency and eliminates the risk. WHICH TYPE OF DUCT CLEANING SHOULD YOU CHOOSE? Having your heating and air-conditioning ducts cleaned by AmericAir Control is a smart decision for many reasons. Eliminating the buildup of dust, pet dander, molds, and other harmful deposits makes your home a healthier, cleaner place to live. AmericAir Control Duct Cleaning offers several levels of duct cleaning services in the Detroit Metro area, each suited to different degrees of build-up and designed for different situations. Choosing the right air duct cleaning method should be based on advice from a professional and in consideration of your budget. FIREPLACE AND CHIMNEY CLEANING ARE A MUST! Few things feel as much like home than a blazing fire in the fireplace on a cold winter’s evening. That’s why so many Michigan homes have a fireplace. We all love to curl up and watch the glow with our families. There’s a danger, though. Unless a fireplace and chimney are cleaned regularly and properly, a chimney fire, caused by a build-up of creosote and soot can end in total disaster. If you have a fireplace, you need regular, professional fireplace and chimney cleaning. Summary: High energy costs cause increases in heating and air conditioning every year in the Detroit Metro Area. If your furnace and air conditioning air ducts are dirty, your home comfort costs are higher than they should be. Professional duct cleaning can save you hundreds of dollars. Summary: What you don’t know about your heating and air conditioning system and the ductwork in your home can cause you more problems than you may realize. Learn how your health and budget may be at risk and what you can do about it. Summary: The heating and air conditioning ducts in your home can collect dust, allergens, molds, and bacteria during normal operation. Many Michigan homeowners neglect the hidden risks in their homes and put their family’s health in danger. Having your ducts professionally cleaned will remove contaminants and keep them from circulating in your home.